This article is about the position in American and Canadian football. For other uses, see Linebacker (disambiguation). A linebacker (LB or backer) is a playing position in American football and Canadian football. Linebackers are members of the defensive team, and line up approximately three to five yards (4 m) behind the line of scrimmage, behind the defensive linemen, and therefore "back up the line". 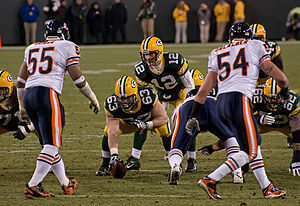 Linebackers generally align themselves before the ball is snapped by standing upright in a "two-point stance" (as opposed to the defensive linemen, who put one or two hands on the ground for a "three-point stance" or "four-point stance" before the ball is snapped). The goal of the linebacker is to provide either extra run protection or extra pass protection based on the particular defensive play being executed. Another key play of the linebacker position is blitzing. A blitz occurs when a linebacker acts as an extra pass rusher running into any exposed gap. When a blitz is called by the defense, it is mainly to sack or hurry the opposing offense's quarterback. Linebackers are often regarded as the most important position in defense, due to their versatility in providing hard hits on running plays or an additional layer of pass protection, when required. Similar to the "free safety" position, linebackers are required to use their judgment on every snap, to determine their role during that particular play. Before the advent of the two-platoon system with separate units for offense and defense, the player who was the team's center on offense was often, though not always, the team's linebacker on defense. Hence today one usually sees four defensive linemen to the offense's five or more. Most sources claim coach Fielding H. Yost and center Germany Schulz of the University of Michigan invented the position. Schulz was Yost's first linebacker in 1904 when he stood up from his usual position on the line. Yost was horrified at first, but came to see the wisdom in Schulz's innovation. William Dunn of Penn St. was another Western linebacker soon after Schulz. However, there are various historical claims tied to the linebacker position, including some before 1904. For example, Percy Given of Georgetown is another center with a claim to the title "first linebacker," supposedly standing up behind the line well before Schulz in a game against Navy in 1902. Despite Given, most sources have the first linebacker in the South as Frank Juhan of Sewanee. In the East, Ernest Cozens of Penn was "one of the first of the roving centers," another, archaic term for the position, supposedly coined by Hank Ketcham of Yale. Walter E. Bachman of Lafayette was said to be "the developer of the "roving center" concept". Edgar Garbisch of Army was credited with developing the "roving center method" of playing defensive football in 1921. In professional football, Cal Hubbard is credited with pioneering the linebacker position. He starred as a tackle and end, playing off the line in a style similar to that of a modern linebacker. The middle or inside linebacker (MLB or ILB), sometimes called the "Mike" or "Mack", is often referred to as the "quarterback of the defense". Often it is the middle linebacker who receives the defensive play calls from the sideline and relays that play to the rest of the team, and in the NFL he is usually the defensive player with the electronic sideline communicator. A jack-of-all-trades, the middle linebacker can be asked to blitz (though they often blitz less than the outside linebacker), cover, spy the quarterback, or even have a deep middle-of-the-field responsibility in the Tampa 2 defense. In standard defenses, middle linebackers commonly lead the team in tackles. The terms middle and inside linebacker are often used interchangeably; they are also used to distinguish between a single middle linebacker playing in a 4–3 defense, and two inside linebackers playing in a 3–4 defense. In a 3–4 defense, the larger, more run-stopping-oriented linebacker is usually still called "Mike", while the smaller, more pass protection/route coverage-oriented player is called "Will". "Mikes" usually line up towards the strong side or on the side the offense is more likely to run on (based on personnel matchups) while "Wills" may line up on the other side or even a little farther back between the defensive line and the secondary. The outside linebacker (OLB), sometimes called the "Buck, Sam, and Rebel" is usually responsible for outside containment. This includes the strongside and weakside designations below. They are also responsible for blitzing the quarterback. Only is the OLB responsible for outside containment and blitzing the Quarter Back they also have pass coverage in the flats sometimes call A drop. Outside linebackers pass coverages covers quick slants outside, in curls in the flats. The "flats" are the edge of the field closest to the sideline, from the line of scrimmage down about ten yards. 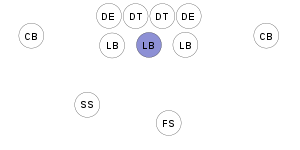 The strongside linebacker (SLB) is often nicknamed the "Sam" for purposes of calling a blitz. Since the strong side of the offensive team, is the side on which the tight end lines up, or whichever side contains the most personnel, the strongside linebacker usually lines up across from the tight end. Often the strongside linebacker will be called upon to tackle the running back on a play because the back will be following the tight end's block. He is most often the strongest linebacker; at the least he possesses the ability to withstand, shed, and fight off blocks from a tight end or fullback blocking the backside of a pass play. The linebacker should also have strong safety abilities in pass situation to cover the tight end in man on man situations. He should also have considerable quickness to read and get into coverage in zone situations. The strongside linebacker is also commonly known as the left outside linebacker (LOLB). The weakside linebacker (WLB), or the "Will" in 4–3 Defense, sometimes called the backside linebacker, or "Buck", as well as other names like Jack or Bandit, must be the fastest of the three, because he is often the one called into pass coverage. He is also usually chasing the play from the backside, so the ability to maneuver through traffic is a necessity for the Will. The Will usually aligns off the line of scrimmage at the same depth as Mike. Because of his position on the weakside, the Will does not often have to face large interior linemen one on one unless one is pulling. In coverage, the Will often covers the back that attacks his side of the field first in man coverage, while covering the weak flat in Texas Loop or hooks/curl areas in zone coverage. The weakside linebacker is also commonly known as the right outside linebacker (ROLB). The number of linebackers is dependent upon the formation called for in the play; formations can call for as few as none, or as many as seven. Most defensive schemes call for three or four, and they are generally named for the number of linemen, followed by the number of linebackers (with the 46 defense being an exception). For example, the 4–3 defense has four defensive linemen and three linebackers; conversely, the 3–4 defense has three linemen and four linebackers. In the 4–3 defense there are four down linemen and three linebackers. The middle linebacker is designated "Mike" (or "Mac") and two outside linebackers are designated "Sam" and "Will" according to how they line up against the offensive formation. If there is a strong call, the linebacker on the strongside is called "Sam", while the linebacker on the weakside is called "Will". The outside linebacker's job is to cover the end to make sure a run doesn't escape and to watch the pass and protect from it. The middle linebacker's job is to stop runs between the tackles and watch the entire field to see the play develop. On pass plays, the linebackers' responsibilities vary based upon whether a man or zone coverage is called. In zone coverage, the linebackers will generally drop into hook zones across the middle of the field. However, some zones will send the outside linebackers into the flats (area directly to the left and right of the hash marks, extending 4–5 yards downfield). In a man-to-man call, the "Sam" will often cover the tight end with help from a safety over the top, while at other times, the "Sam" and "Will" will be responsible for the first man out of the backfield on their side of the center, with the "Mike" covering if a second man exits on that side of the field. In the "Tampa 2" zone defense, the middle linebacker is required to drop quickly into a deep middle zone pass coverage thus requiring a quick player at this position. In the 3–4 defense there are three linemen playing the line of scrimmage with four linebackers backing them up, typically two outside linebackers and two inside linebackers. The weakside inside linebacker is typically called the "Will," while the strong side or middle inside linebacker is called the "Mike". "Sam" is a common designation for strong outside linebacker, while the other position is usually called "Jack" and is often a hybrid DE/LB. Usually, teams that run a 3–4 defense look for college defensive ends that are too small to play the position in the pros and not quite fluid enough to play outside linebacker in a 4–3 defense as their "Jack" linebacker. The idea behind the 3–4 defense is to disguise where the fourth rusher will come from. Instead of the standard four down-linemen in the 4–3, only three players are clearly attacking nearly every play. A key for running this defense successfully is having a defensive front of three large defensive linemen who command constant double teams. In particular, the nose tackle, who plays over the offensive center, must be able to hold ground and to occupy several offensive blockers to allow the linebackers to make plays. The focus of the 3–4 defensive line is to occupy offensive linemen thus freeing the linebackers to tackle the running back or to rush the passer or otherwise drop into pass coverage. Generally, the primary responsibilities for both outside linebackers are to stop the run and rush the quarterback in passing situations, in which they line in front of the tackles like true defensive ends. The outside linebackers in a 3–4 defense are players who are very skilled at rushing the quarterback and they would be playing defensive end in a 4–3 defense. When it comes to the inside linebackers, one is generally a run-stuffing player who is better able to handle offensive linemen and stop running backs when the offense features a running play, while the other is often a smaller, faster player who excels in pass coverage. However, the smaller or cover LB should also be able to scrape and plug running lanes decently. The design concept of the 3–4 defense is to confuse the offensive line in their blocking assignments, particularly in pass blocking, and to create a more complex read for the quarterback. Many 3–4 defenses have the ability to quickly hybrid into a 4–3 on the field. In the 46 defense, there are four linemen, three linebackers and a safety who is moved up behind the line of scrimmage. Thus, it appears as if there are 4 linebackers, but it is really 3 linebackers with one safety playing up with the other linebackers. Three of the defensive linemen are over both of the offensive guards and the center, thereby making it difficult to double team any one of the three interior defensive linemen. This can also take away the ability of the offense to pull the guards on a running play, because this would leave one of the defenders unblocked, or, at best, give another lineman a very difficult block to make on one of the defenders. The safety, like the linebacker, can blitz, play man-on-man, play zone, or drop back into deep coverage like a normal safety would do. The 46 is used in heavy run situations to stop the run, when a team wants to bring lots of pressure, or merely to confuse the quarterback and offensive line. This defense is effective at run-stopping but is weaker than a 4–3 defense at pass coverage because it uses only three defensive backs. This defensive scheme is often played with two inside line backers and two outside line backers. The names of the two inside line backers are often called Sam and Mike and these two are lined up about 4 yards from the line of scrimmage and are lined up with the offensive guard. The inside line backers are often more of a run player so they will defend the run before they will the pass. These line backers will be reading the offensive guard so they know what to do, so if the guard sets up to pass block the line backers know to get into their zone in order to cover the pass. If the guard come out for a run play they know that they need to fill the gap that they are supposed to so that they can make a play if it comes to them. Also, these inside line backers are often called on a blitz which is when no matter what the offense does, as soon as that ball is snapped they are shooting their gap and trying to get into the back field to make a play as fast as possible. Outside line backers sometimes are considered to be pass players before they are run players. But that depends on where they are lined up, if they are outside of the box of the defense then they will be pass first players, but if they play inside the box lined up behind the defensive end then they are typically a run player. One of the outside linebackers is usually called into either blitz or pass coverage to make up for the missing DB. In the NFL and college football, this alignment is used mainly in short yardage situations or near the goal line. It is commonly used in high school football. ^ Big Ten Football, Its Life and Times, Great Coaches, Players, and Games, page 193, Mervin D. Hyman, Gordon S. White, Macmillan, 1977, ISBN 0-02-558070-1. ^ "First linebacker found". The Newark Advocate. October 30, 1974. p. 27. Retrieved June 4, 2015 – via Newspapers.com. ^ "More Trivia". The Pantagraph. September 10, 1967. p. 28. Retrieved June 4, 2015 – via Newspapers.com. ^ Dave Lewis, "Once Over Lightly," The Long Beach Independent, July 29, 1954. ^ Malcolm Bingay, "A Little About This and That: How Schulz Entered Michigan Still A Mystery," The Morning Herald, May 1, 1951; ; "Frankly Speaking: Schulz' Great Grid Exploits Reviewed," The Long Beach Press-Telegram, April 17, 1951. ^ Alexander M. Weyand (1962). Football Immortals. p. 128. ^ "Ernest B. Cozens". Pennsylvania Gazette. June 28, 1929. p. 751. ^ "Henry 'Hank' Ketcham player profile". College Football Hall of Fame. ^ "Col. Edward Garbisch and His Wife, Bernice, Die". Palm Beach Daily News. December 16, 1979. p. A1, A15. ^ Richard Whittingham. What a Game They Played: An Inside Look at the Golden Era of Pro Football. p. 62. ^ a b Zimmer, Ben (September 9, 2012). "How Sam, Mike and Will Became Football Positions". The Boston Globe. Boston. Retrieved October 5, 2013. (Subscription required (help)). ^ JW Nix (August 30, 2011). "NFL Defensive Quarterbacks: The 10 Best Middle Linebackers in Football Today". Bleacher Report. Retrieved October 5, 2013. ^ Bradley, Michael (2003). Football All-Stars: The Nfl's Best. The Rosen Publishing Group. p. 55. ISBN 0823936902. ^ Weisman, Larry (August 5, 2008). "Mayo leaning on 'old guys' to pick up Pats system on the fly". USA Today.